Graphical representations of the Kri Bima Suci. 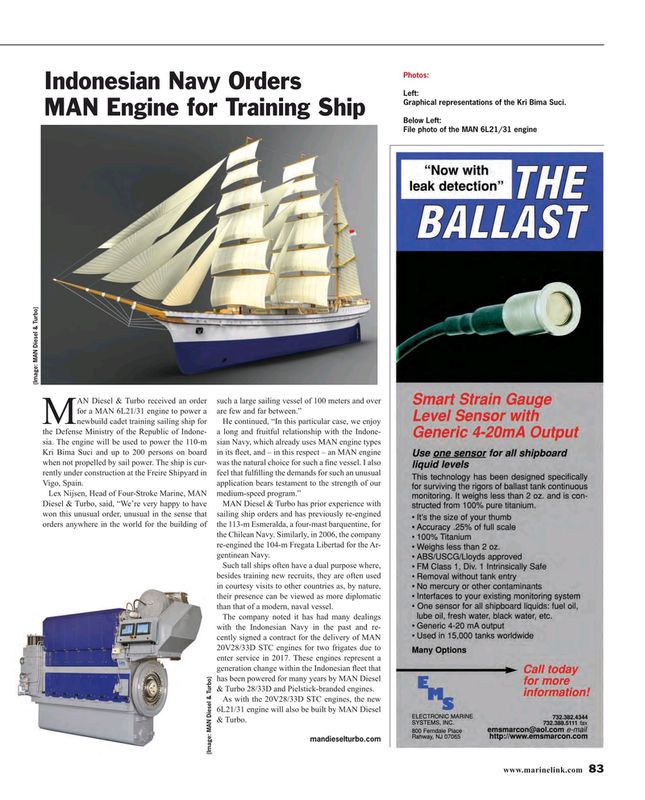 Diesel & Turbo, said, “We’re very happy to have MAN Diesel & Turbo has prior experience with won this unusual order, unusual in the sense that sailing ship orders and has previously re-engined orders anywhere in the world for the building of the 113-m Esmeralda, a four-mast barquentine, for the Chilean Navy. Similarly, in 2006, the company re-engined the 104-m Fregata Libertad for the Ar- gentinean Navy. Such tall ships often have a dual purpose where, besides training new recruits, they are often used in courtesy visits to other countries as, by nature, their presence can be viewed as more diplomatic than that of a modern, naval vessel. The company noted it has had many dealings with the Indonesian Navy in the past and re- cently signed a contract for the delivery of MAN 20V28/33D STC engines for two frigates due to enter service in 2017. These engines represent a generation change within the Indonesian ? eet that has been powered for many years by MAN Diesel & Turbo 28/33D and Pielstick-branded engines. As with the 20V28/33D STC engines, the new 6L21/31 engine will also be built by MAN Diesel & Turbo.